Manatee advocates Anita McCarthy and Kent Andres enjoy observing the calm, graceful manatees at Blue Spring State Park. “You can’t help loving them,” says Anita. Note: A high resolution jpeg (300 dpi) of a manatee image, as well as a photo of Anita and Kent, are available upon request. 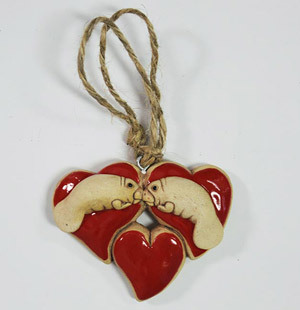 Get creative this Valentine’s Day – do something extra special. Few gifts could rival a real, living manatee from Save the Manatee Club. Manatee gift adoptions given as a Valentine’s Day gift help to educate others about this unique, gentle marine mammal and also support the Club’s many conservation programs. 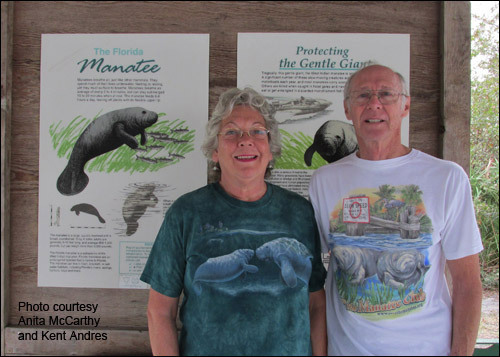 Anita McCarthy from Fernandina Beach, Florida, decided to adopt a manatee for her “very special guy,” Kent Andres, also from the same locale, after visiting Blue Spring State Park, in Orange City, Florida. A individually handcrafted manatee heart ornament is included with every gift adoption of $35 or more (supplies are limited). For $25, Save the Manatee Club will send your special Valentine a manatee adoption certificate with photo, and a life history of a real, living endangered manatee. For adoptions of $35 or more, we will also include a lovely, handmade manatee heart ornament made exclusively for SMC by artist Kevin Rowley. In addition, each gift recipient receives a membership handbook, the Club’s quarterly newsletter, The Manatee Zone, which features updates on the adoptive manatees, and the bi-monthly eNewsletter, Paddle Tales. A list of the manatees available for adoption can be found on the Club’s website. Save the Manatee Club, an international nonprofit conservation and manatee welfare organization, was co-founded in 1981 by singer/songwriter Jimmy Buffett and former U.S. Senator Bob Graham, when he was governor of Florida. Funds raised by the Adopt-A-Manatee® program go toward public awareness activities and educational materials, including free waterway signs and boating banners. The Club also distributes free education materials to teachers and students across the U.S. and internationally and helps fund manatee research projects and manatee rescue, rehabilitation, and release efforts. In addition, Save the Manatee Club helps protect manatees and their habitat through conservation, advocacy, and legal and grassroots action, and supports international efforts, providing supplies to rehabilitation partners worldwide. To adopt a manatee for Valentine’s Day, visit Save the Manatee Club’s website, or call 1-800-432-JOIN (5646). Also, visit The Manatee Store, the Club’s online gift catalog, for additional Valentine’s Day gift ideas at shopsavethemanatee.org. Watch manatees in real time in their natural habitat on the Club’s Blue Spring webcams at ManaTV.org.